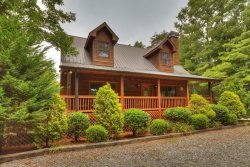 Fox Hollow is a comfortable cabin near Blue Ridge, GA, McCaysville, GA and Copperhill, TN. Close to whitewater rafting, hiking trails, shopping, restaurants and is managed by My Mountain Cabin Rentals. If you are looking for a getaway....here it is! Fox Hollow has the back to nature feel that everyone wants when they think of coming to the mountains. Aside from a charming cabin/almost farmhouse feel, the outside of the cabin is paradise. There's a nice sized creek in the huge backyard that is good for fishing or recharging your soul! Nothing is better than the sound of a creek to restore you. Next to the creek is a fire pit....so gather your family, friends or your sweetie around it and listen to the sounds of nature, roast marshmallows and relax. If you have kids, they can run their little hearts out or bring their equipment and play baseball/badminton etc in the huge yard. Every now and then, especially in the morning or early evening, look across the creek to the field beyond and watch the deer as they meander through. You might want to bring your binoculars and camera to this cabin! Lets not forget about the hot tub out on the open deck! It will relax you after a long day of adventuring. You are VERY close to Blanche Manor Stables for horseback riding. Give them a call at 706-455-7433 for reservations or visit their website at www.BlancheManor.com. The twin cities of McCaysville and Copperhill are only 7 miles from the cabin and there you will find restaurants and shops. Amenities: Screened Porch, Hot Tub, Dishwasher, Washer, Dryer, Phone, Microwave, Coffee Maker, Satellite TV, DVD, Gas Grill, Fire pit, a creek that runs through the back yard.